These washers are ideally suited for joining machine sections which are out of parallel. They adjust themselves for a positive, firm base. 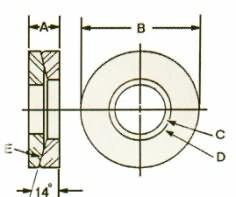 With radius “E” and the angular 140 combination, line contact is formed around the two mating washer surfaces, allowing the two washers the ability to seek misalignment in the companion clamping members. The heat treated I.D. of the bottom concave piece is larger than the I.D. of the top convex section for free action. It is precision ground and the sharp edges are removed.